Yesterday Joedyn told us to plan our future trips to coincide with the half to full moon (force me to have to spend two weeks here). Wayne woke up early and started plotting out the next trip. 5 years between visits is far too long for Palau, it is so very much like coming home. And even though we have been gone for quite a while, it feels like slipping into a comfortable pair of slippers custom designed for your feet. It is very unpleasant to realize we only have 2 diving days left, and then we return to Hawaii. Admittedly, it isn’t the mainland, but the shoe there sometimes doesn’t fit quite as comfortably...I checked things out, and they have a need for both social workers and lawyers here. Hmmm. It was an early start this morning, unintentionally and intentionally both. 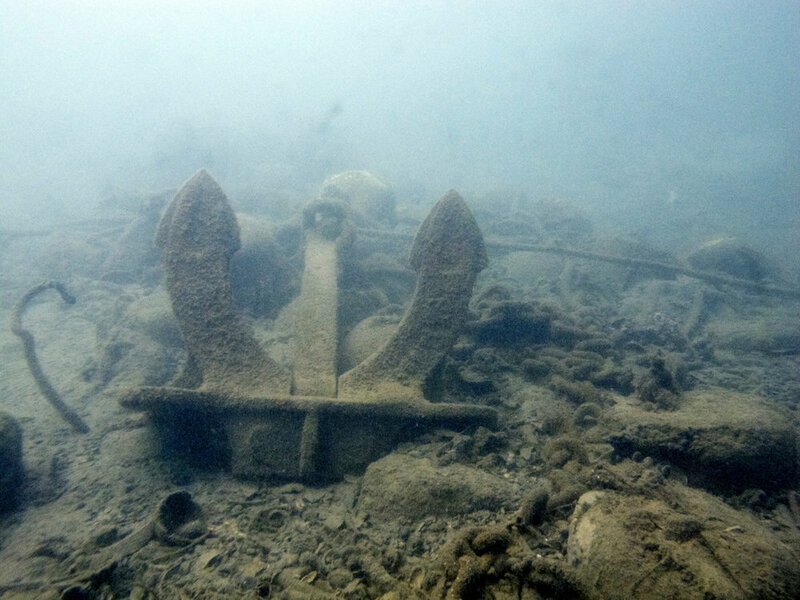 Today we were headed to Ulong Island for two out of three dives, and then to Helmet Wreck, a wreck of unidentified origin (we think a European vessel commandeered by the Japanese for use as a Maru). The ride out was only 30 minutes, but as Joedyn checked the current, and it was going a bit wonky, so we did our first dive at Siaes Tunnel. Looks like no new dives for Wayne and me on this trip, but again, this is an extremely comfortable, custom made pair of slippers! There were no Jacks to greet us at the mouth of the tunnel, it may have been too early, but they showed up a bit later. The mouth of the tunnel was considerably deeper than I had remembered, and it was far too easy to slip down to 120 feet to go see our buddies. There were no long nose hawkfish or white tip reef shark sleeping in the tunnel today, so it really does show how badly the typhoon hit this part of the islands. We exited the tunnel and had a very pleasant wall dive to end it. 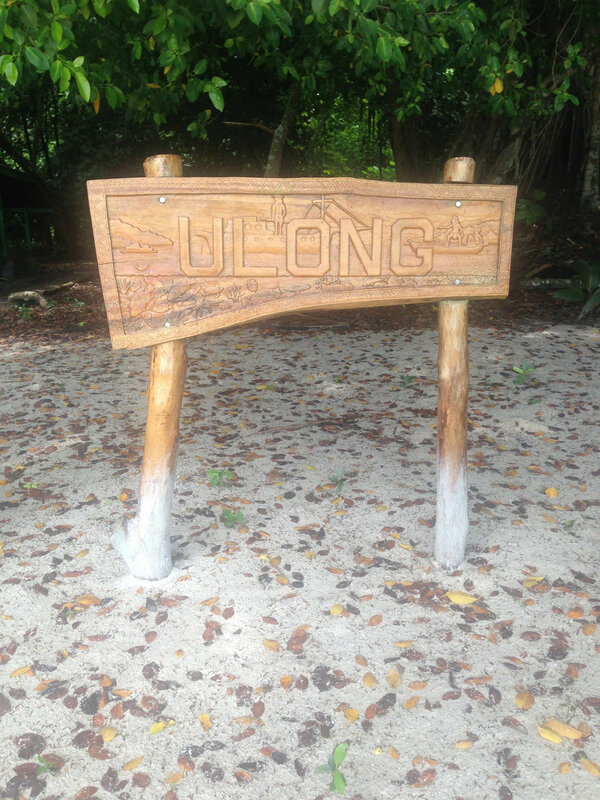 Our second dive was Ulong Channel. The current was still a little iffy, but the life was unbelievable! 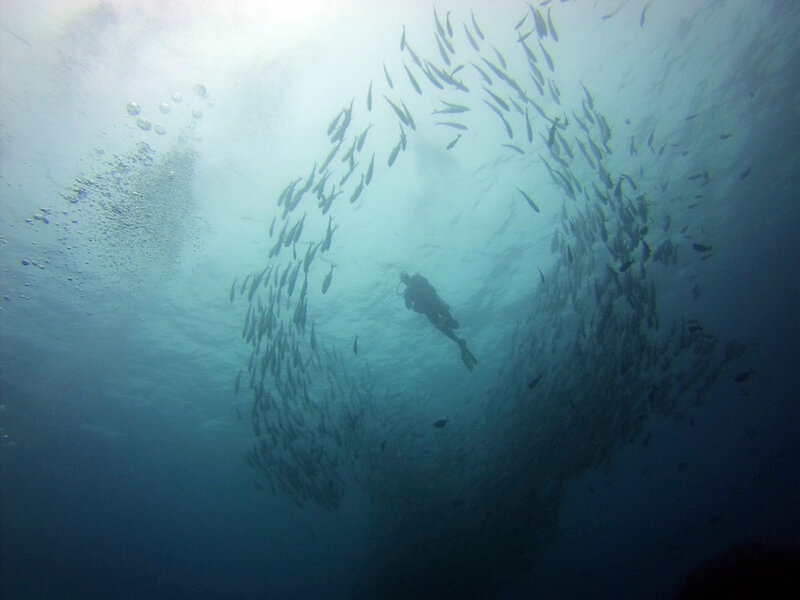 It is grouper spawning season, so it was like a little bit of grouper heaven, mixed in with all sorts of other fish, to include giant clams, those nasty titan triggerfish, and an incredible school of jacks. Lunch was on Ulong Beach, where we were invaded by flies, snorkelers, and another boat full of divers. We left there pretty early and headed out. Our third dive, and last guided dive of the day, was on the helmet wreck, a wreck that the Japanese did not get to cleaning up after World War II. A lot of the artifacts have been moved out of small spaces in order to prevent new divers from going in. We saw a sink with an interesting logo. We didn’t just penetrate the wreck for the wreck’s sake, there was a crocodilefish, a pair of batfish getting cleaned, and other little critters abounding. Not too crappy for a muck dive. However, we terminated early when three out of four divers ran out of battery power for their cameras. Dinner was at the Palm Bistro Cafe, home of the Red Rooster brewing. The food is much improved, and worth coming back. Three out of four of us got the special Thai seafood curry, and one of us (um, ME) had the lamb burger. Yum, yum, yum.